Photo Description: Sunset on the water. Top two-thirds of photo is of the sky, mostly grey clouds. The clouds reflect more and more vibrant pinks, oranges, and yellows the closer to the setting sun. On the horizon, a very thin line of trees on some couple distant islands are visible. below the horizon the water lazily swirls reflections of the skies colors in less and less intensity as the image nears the bottom, closest to the photographer. In the top of the image, a quotation "Thanks to him, I was in a place in which I could again not just see, but feel the injustice of the world. This is such a gift because we see injustice every day, but if we can’t feel it, we will do nothing to change it. -Thomas J. Ameloot, www.lifeinmydays.com"
You know the saying; “’Tis better to have loved and lost, than never to have loved at all?” It’s a heartbreaking statement that I never want to have to repeat. But, here I am, agreeing. Recently, I’ve cried more and hurt more than I had in years, due to a relationship. I have loved and lost. It’s been tempting to utter the words “I wish I never met you.” There were times that I wished I were dead, so as not to continue the pain. About three quarters of a year ago, it was my fate to fall in love. I tried to make this love not about falling, to make this just a decision. I tried to be a good bell hooks fan and actively love. Despite my best efforts, this was a combination. Part fallen, part decision. I was loving a person with mental illnesses. It wasn’t the first time I’ve loved someone with mental illness, but it was the first time it was largely discussed upfront, or at all. In past relationships, the illness had been there, but there was no discussion. He was very self-aware, so, the discussion was important to have upfront. But it couldn’t prepare me. Words and actions are two different things. The actions that would allow me to understand what these things meant wouldn’t start to surface for about three months. It was also the first time the person I was loving had so much mental illness on their plate. Sometimes, I thought he defined himself by his illness, and found that to be true, later. It’s common for a person with illness to define themselves in this way, and be afraid to heal. If they heal, what will be left, what will be interesting about them? But I also began understanding that some things do not heal. This handsome man loved me right out of my armor. I remember the walls of ice melting, steaming in puddles at the floor beneath us. My beauty was apparent, it was right there in his eyes. I could see myself, and I could see him. There could be trust here, which means I could let go, be free to breathe. There was this moment where we both just relaxed, exhaled, in each other’s arms. I’m sure at least one of us cried. My new armor-less body had been exposed to so many emotions. Years ago, the empath in me had constructed strong, thick, and cold walls to ensure I wouldn’t be constantly bombarded by people’s energy and emotions. Now that the walls had come down, I had to learn to live in this world, again. He helped me come to terms and work through many of the feelings and thoughts that were flooding through me. Thanks to him, I was in a place in which I could again not just see, but feel the injustice of the world. This is such a gift because we see injustice every day, but if we can’t feel it, we will do nothing to change it. So many things in my life are better. I no longer drink or smoke, so I’m not killing myself so quickly. I’m devoting time for helping to change the world in a positive way. I’m reaching out to communities and working with members to create and continue projects that can help improve our world. I’m going to protests and having so many more conversations. I’m keeping my eyes open and engaging with people who are different than me. I’m still living with hurt, I’m still living with depression, but I’m living. I’ve gotten counseling and am getting more exercise. I’ve left a job that made me feel trapped, and have started building something that will make me feel good in work, and will give me the space to live a life that I want to live. This man was a catalyst in all of this. While it is hard to have lost, the benefits of our relationship will be with me for the rest of my life, and I am deeply grateful. There is a film in which they compare heart ache to any other muscle ache. When we use a muscle, especially one that hasn’t been used in a while, it will ache afterwards, but it will also become stronger. When loving someone with mental illness, there are many things we can do to be good partners. Here are some that I took away from this relationship. 1. Talk - Have conversations in the beginning asking what you can do and what they go through. But, don’t push or be too invasive. These things can be hard to talk about. They can be impossible to talk about. Sometimes we who suffer with mental illness don’t even understand what is happening, so how could we ever explain it? But the conversations are important. Find out what conditions they have. 2. Research - Once you find out what you can about what your lover or friend is going through, go to the library, look for a good source on Google, talk to a therapist or counselor, ask a friend who may have been in a similar situation. Read books. 3. Therapy - Speaking of therapists or counselors, they can help. Support also requires making sure we are coming from a healthy place. It becomes increasingly difficult to support someone in a healthy way if you are not coming from a healthy place, yourself. For me, I have low self-esteem issues. It’s very hard to not take everything personally. This can be annoying, or worse, damaging, to someone who is trying to get healthy. Working with a therapist helped me to put these feelings into perspective. 4. Self Care - Sometimes we might feel like we are falling apart, like we are becoming mentally ill, or more so, when focusing on someone else. Being selfless is often placed on a pedestal and looked at as heavenly, but it’s not always the case. We all have needs and need to look after and advocate for ourselves. If we are not honest and caring for ourselves, we may start resenting our partner and getting angry. I found myself angry when I would skip something I wanted to do, as to be there for my lover, who didn’t need me there, anyway. It took me a while to realize my inner-child was upset because he wasn’t consulted before giving up this or that thing. Then I learned to ask myself, am I okay with this or that thing? 5. Walking Away - It’s not selfish to leave when you have nothing good to contribute. You are not abandoning anyone if you need to walk away. Staying might just make things worse. Let them know that you love them and they can reach out if they need you. 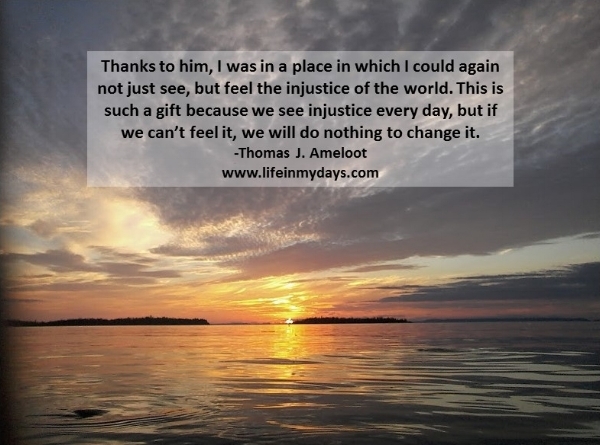 Thomas Ameloot is an Editor, Board Member, and Secretary for Life in My Days. He has had many adventures travelling around the U.S., writing and performing music, planting vegetables, tasting coffee, and working as a Food and Beverage Consultant. One of his greatest joys in life is to bring joy to others, usually by making delicious local meals or sharing in laughter.